3 Crazy Running Pains - Solved! You are here: Home / Exercise / 3 Crazy Running Pains—Solved! There are plenty of enticing things to keep you from your workout—your sweatpants, your warm couch, that extra episode of Breaking Bad you stayed up to watch last night. So you don’t need one of these weird, but totally common workout pains to sideline your success. Learn how to prevent them from popping up, plus the fastest healing tips if you have already got them. 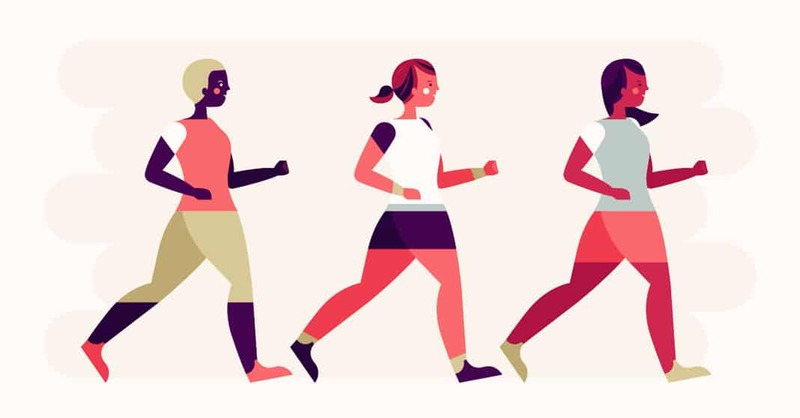 CHECK ALL POSSIBLE HIGH-RISK AREAS – Between the thighs, at the band of your sports bra, where your sneaker meets your ankle, waistbands, and armpits are the most common areas of chafing. It could be a result of skin-on-skin friction or that from clothing. CLEAN IT OUT – If any of these areas are on the verge of bleeding (or have already started to bleed), wash the area with soap and cool water, treat it with some hydrogen peroxide and antibiotic ointment, and even go as far as to dress the area with gauze and tape to be sure it heals properly. KEEP IT DRY – Keep talcum, baby powder, or cornstarch on hand and sprinkle in shoes, under sports bras, and around waistbands to soak up extra moisture and keep chafing at bay. LUBRICATE – If you are increasing your mileage or when all else fails, reach for one of the many sports lubricating balms on the market. These balms, usually petroleum jelly-based, create a slick barrier so your skin and clothing can move with you, sans friction. Choose something in a stick form that you can apply on the go. KNOW THE EARLY SIGNS – It usually starts with swelling and pain on the outside of the knee. An easy test is to bend your knee at a 45-degree angle. If you have an IT Band problem, you will most likely feel pain on the outside of the knee. TYPICAL CAUSES – Activities that cause the leg to repeat an inward motion are typically the causes. IT Band syndrome is often found in women, since women’s hips tend to tilt in a way that causes their knees to turn inwards. Other causes can include running too much, old shoes, running on a track and running on a decline. 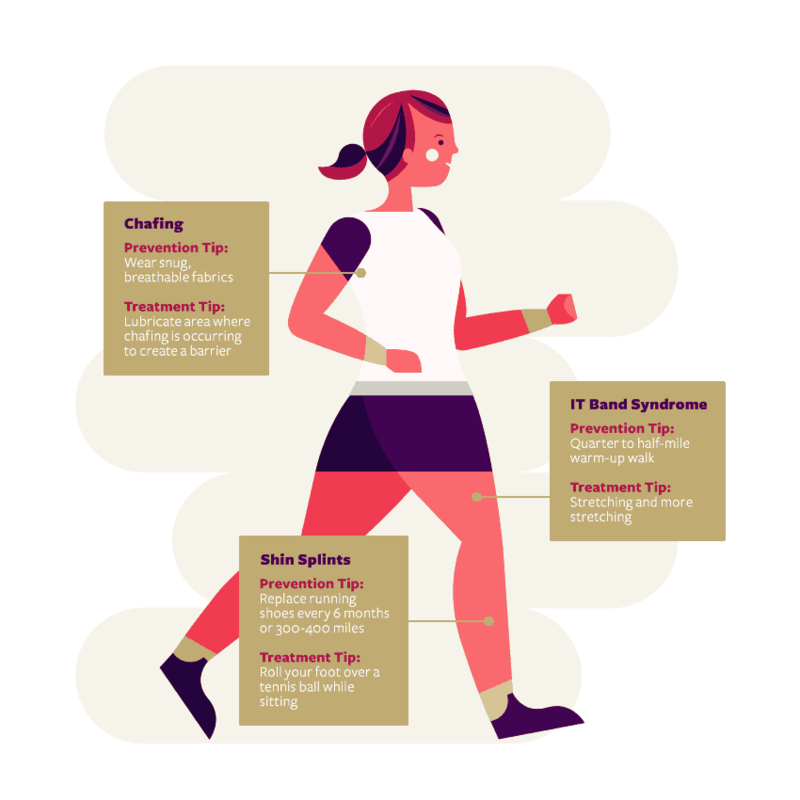 CHANGING IT UP – Running the same routine, number of miles and in the same shoes are all habits that could lead to IT Band Syndrome. Prevention can come in the form of simply mixing up your routine. Try running in different directions around the track, rotate different running shoes and try to avoid concrete surfaces. ADD IN A WALK – Adding a quarter or half a mile walk as a warm-up can allow the IT Band a chance to stretch and get ready for a run. This will definitely aid in the prevention of a future IT Band issue. HEALING PROCESS – As soon as you start feeling pain around the knee area, stop running. The best medicine for IT Band Syndrome is rest. Stretching and applying ice/heat will also help the healing process. Continue exercising by doing some cycling, swimming and other exercises that offer a different motion from running. If the pain is persistent, schedule some time to meet with a sports medicine doctor to find the path for treatment. Your shins take the brunt of each step and stride. And if you’ve really hit the ground, er, running with your new workout, you could be susceptible to shin splints—a stiffness or soreness in the shins caused by strong calf muscles pulling on weaker shin muscles. Here’s the low down on finding relief, plus how to keep them from coming back. WATCH YOUR MILEAGE – Increasing mileage too quickly is one of the most common causes of shin splints. It’s best to stick to the ten percent rule: only increase your mileage or intensity by ten percent each week. Any more than that can lead to injury! VARY YOUR WALKING OR RUNNING SURFACES – Too much time on the hard, unforgiving concrete can put even more strain on your muscles and joints. Look for some grassy or dirt trails and hit up that cushy track at your local high school amid your roadside runs. PENCIL IN SOME REST DAYS – If you already have shin splints, you might need to stay off the trails for a few weeks to give those tender muscles time to heal. While you’re resting, you can still cycle or swim to stay in shape (especially if you’re training for something), but if it hurts to walk, that’s a clear sign you should keep resting. If you’re interesting in stopping them before they start, be sure to avoid running two days in a row when you first start your training program. FIND RELIEF – Ibuprofen and cold packs are your best friends while you recover. To ease the pain while you walk, try rolling your foot over a tennis ball or a full plastic water bottle while you sit. REPLACE YOUR RUNNING SHOES – Experts say you should replace your running/walking shoes every six months or 300-400 miles, whichever comes first.